Clinical history: A 40-year-old man with pentalogy of Cantrell including omphalocele, epicordis with ventral herniation into the abdominal cavity, chest wall deformities, and congenital heart disease presented to our adult congenital heart disease clinic with lower extremity swelling. His complex congenital heart disease consisted of double outlet right ventricle (DORV) with D-malposition of the great arteries, severe left pulmonary artery stenosis, severe pulmonary insufficiency, cor triatrium sinister and ventricular herniation into the abdominal cavity. In infancy, he underwent classic Blalock Tausig (BT) shunt (suggesting that pulmonary blood flow must have been severely limited by pulmonary stenosis) and closure of skin over the abdominal portion of the heart. He had a second classic BT shunt at 2 years old which was followed by a final shunt revision at 6 years old. He subsequently underwent a baffle closure of the ventricular septal defect creating an outlet from the left ventricle to the aorta, which was situated anatomically above the right ventricle. This is typically combined with a conduit from the right ventricle to the pulmonary artery performed at 8 years of age. This combination of procedures is often referred to as a 'Rastelli procedure' developed by Italian physician and cardiac surgery researcher, Giancarlo Rastelli in 1967 at the Mayo Clinic. At 18 years old, the patient had his final intervention which was the closure of a residual atrial septal defect. When he transitioned to adult care, he was followed by general adult cardiology for more than 10 years. The patient presented to our adult congenital cardiology clinic with significant lower extremity edema and abdominal fullness. On physical exam, his ventricles were seen beating directly under his skin. Also, 4+ lower extremity swelling and significant hepatosplenomegaly were noted. The initial transthoracic echocardiogram was limited due to the orientation of his heart but interestingly showed a possible incidental but unobstructed cor-triatriatum sinister (video 1). Cardiac magnetic resonance (CMR) was performed to determine his anatomy and assess the right ventricle. CMR imaging revealed that the heart was located in the right hemithorax and the apex pointing to the left, although there is eventration of the diaphragm with both the left and right mid to apical portions of the ventricles lying in the abdominal cavity (this segment does not have the anterior protection of the sternum cavity, and is directly beneath the skin). Ventricular cavities are just anterior to the liver. There are features of double outlet of right ventricle with d-malposition of great arteries with aorta anterior and to the right of pulmonary artery. The main pulmonary artery and right pulmonary artery are severely dilated, but the left pulmonary artery is severely stenotic. CMR confirmed the unobstructed cor-triatriatum sinister. Figures 1-4. Illustrate the anatomy above. These images were created from a SSFP respiratory navigated 3D dataset. LA – Left atrium, RA – Right atrium, Ao – Aorta, LV – Left ventricle, RV – Right ventricle, CT - cor-triatriatum sinister, IVC – inferior vena cava, PA – pulmonary artery. The 3D dataset was used to plan the SSFP cines. The VCD-gated and respiratory-navigated 3D balanced SSFP single cardiac rest phase imaging shown above was extremely helpful to define the anatomy. It is also helpful in complex cases to define standard planes for cine imaging as in this case. Segmented balanced SSFP cine imaging complemented this anatomical assessment and provided simultaneous functional assessment. Video 2 shows the position of the heart in the abdomen. Delayed enhancement imaging showed no foci of delayed myocardial enhancement to suggest scar/fibrosis in the left or right ventricle. Due to the severe pulmonary insufficiency, right ventricle enlargement and reduced RV systolic function (Table 1, videos 3-5), he was referred for a pulmonary valve replacement. Video 6 (3D reconstruction) demonstrates the severe left pulmonary artery (LPA) stenosis and the right pulmonary artery (RPA) dilation. A trans-catheter valve without pulmonary artery intervention was felt to be his safest option as the first procedure due to his severe restrictive lung disease and thrombocytopenia. Table 1. Left and right ventricular indices at presentation. The pre- and post-procedure angiogram is shown in video 8. The patient has done well since then. He has not had further palpitations, the lower extremity edema has almost resolved, the amount of diuretics have been decreased, and his NYHA functional class has decreased from 3 to 2. For adult congenital heart disease patients that have gaps in their congenital heart disease care or lack of knowledge of their surgical repairs, CMR is essential in determining complex cardiac anatomy and for interventional planning. 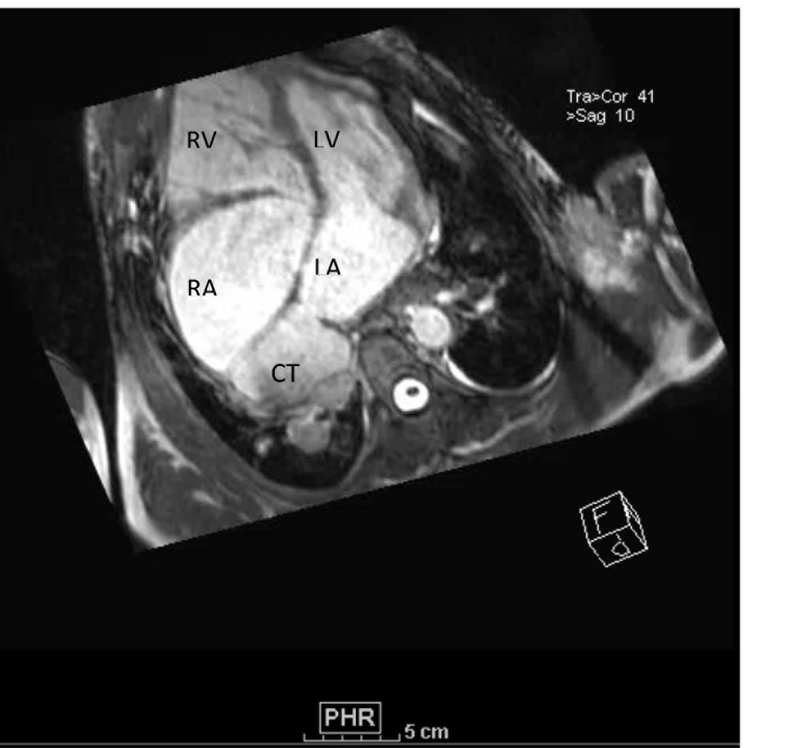 In this case, CMR illustrated the need for pulmonary valve replacement in order to improve his right ventricle size and function. It quantitatively showed a severely enlarged right ventricle (RV end diastolic volume 187 ml/m2) and depressed RV systolic function (RVEF = 37%.) (table 1). Severe pulmonary regurgitation is the most common cause of the severe right ventricular dilation and decreased function in the adult congenital heart disease population. The phase contrast imaging demonstrated severe pulmonary regurgitation with a regurgitant fraction of 41%. Although the accurate assessment of right ventricular volume and function was useful, the 3D datasets from the respiratory navigator SSFP sequence and the cardiac MRA were essential in determining if he was a candidate for surgical or catheter based interventions since his cardiac anatomy spanned both the thorax and abdomen. Pentalogy of Cantrell is an extremely rare congenital anomaly with an incidence 1 per 65,000 live births. Pentalogy of Cantrell includes: omphalocele, congenital heart disease, defect in the pericardium, diaphragm and sternum which may present as ectopia cordis. [i] At the time of this patient’s birth, there was very high infant mortality (50%) with pentalogy of Cantrell in association with complex congenital heart disease. [ii] To our knowledge, he is the oldest living patient with Pentalogy of Cantrell. Most of the reported adult cases of Cantrell’s Syndrome only report a ventricular diverticulum into the abdomen but are not associated with congenital heart disease. [iii] Conotruncal defects are the most common type of reported congenital heart disease with pentalogy of Cantrell. [iv] Double outlet right ventricle falls in this spectrum. [i] Pirasteh A, Carcano C, Kirsch J and Mohammed TL. Pentalogy of Cantrell with Ectopia Cordis: CT Findings. J Radiol Case Rep. 2014 Dec; 8(12):29-34. [ii] Toyama WM. 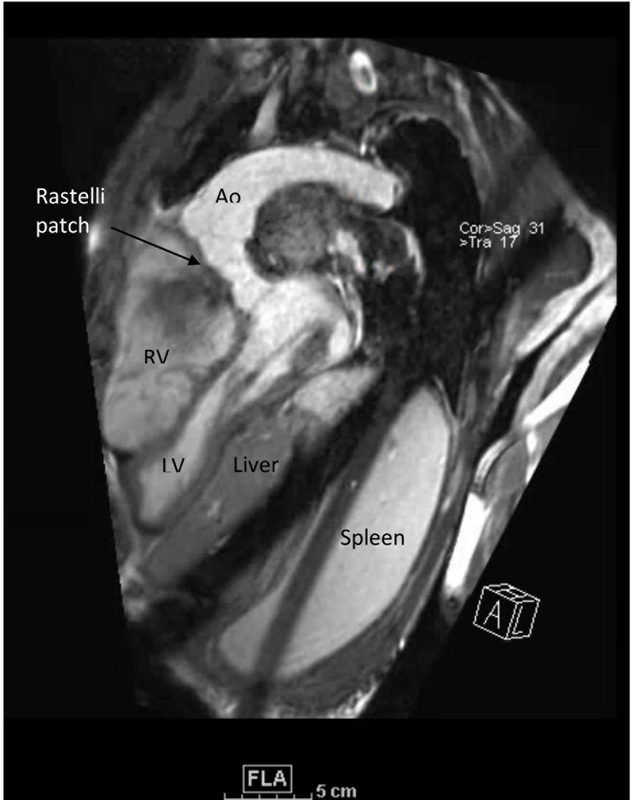 Combined congenital defects of the anterior abdominal wall, sternum, diaphragm, pericardium, and heart: a case report and review of the syndrome. Pediatrics. 1972 Nov; 50(5):778-92. [iii] Gruberg L, Goldstein SA, Pfister AJ, Monsein LH, Evans DM and Leon MB. Images in cardiovascular medicine. Cantrell's syndrome: left ventricular diverticulum in an adult patient. Circulation. 2000 Jan 4-11;101(1):109-10. [iv] Escobar-Diaz MC, Sunderji S, Tworetzky W and Moon-Grady AJ. 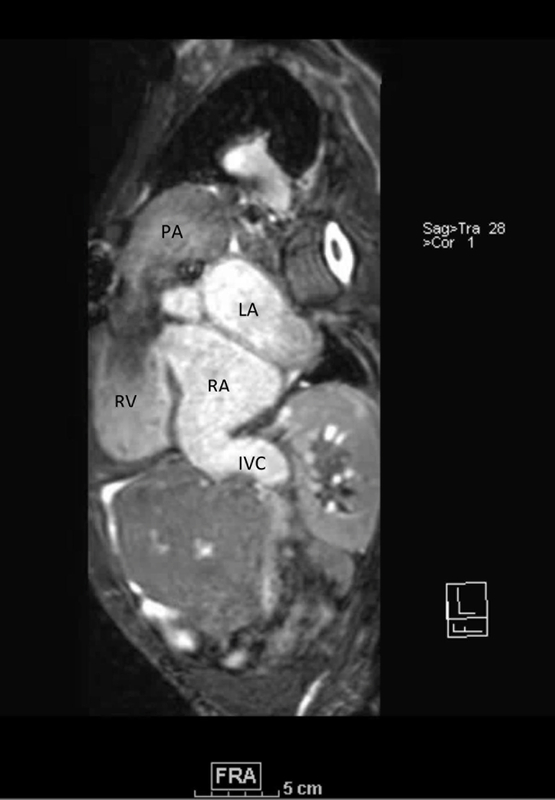 The Fetus with Ectopia Cordis: Experience and Expectations from Two Centers Pediatr Cardiol. 2017 Mar; 38 (3): 531-8. [v] Gilboa SM, Devine OJ, Kucik JE, Riehle-Colarusso T, Nembhard WN, Correa A, Jenkins K and Marelli AJ. Congenital Heart Defects in the United States: Estimating the Magnitude of the Affected Population in 2010. Circulation, 2016. 134(2): p. 101-9. [vi] Gurvitz M, Valente AM, Broberg C, Cook S, Stout K, Kay J, Ting J, Kuehl K, Earing M, Webb G, Houser L, Opotowsky A, Harmon A, Graham D, Khairy P, Glanola A, Verstappen A, and Landzberg M. Prevalence and predictors of gaps in care among adult congenital heart disease patients: HEART-ACHD (The Health, Education, and Access Research Trial). J Am Coll Cardiol, 2013. 61(21): p. 2180-4. [vii] Warnes, C.A., et al. ACC/AHA 2008 guidelines for the management of adults with congenital heart disease: a report of the American College of Cardiology/American Heart Association Task Force on Practice Guidelines (Writing Committee to Develop Guidelines on the Management of Adults With Congenital Heart Disease). Developed in Collaboration With the American Society of Echocardiography, Heart Rhythm Society, International Society for Adult Congenital Heart Disease, Society for Cardiovascular Angiography and Interventions, and Society of Thoracic Surgeons. J Am Coll Cardiol, 2008. 52(23): p. e143-263. Click here to view the CMR images.